It is recommended for users 5'-9" tall or shorter. Natural way to energize your work day. 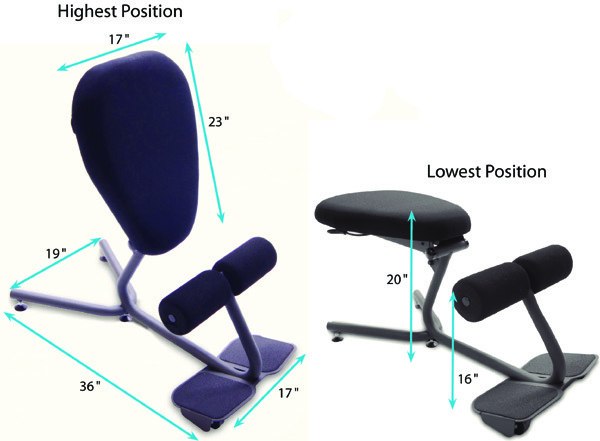 Healthpostures 5000 Stance Move allows the user to achieve several healthy and energetic working positions. Forward sloped sitting, kneeling and assisted standing are all healthy postures that provide the worker with unparalleled well-being and energy in the workplace. This is the only ergonomic, sit to stand, 3 position chair on the market. When you must sit, sit healthy. The new improved Stance Move provides the user with a backless seating design that helps build balance and core muscles while providing hours of comfortable use. The seat can also slope forward to decreases the load on your lower back and minimizes the risk for back pain. Sitting with your thighs in a downward slope increases the activity of your lower leg muscles. As a result return blood flow from the lower legs is improved, and there is less pooling of the blood and pain in the lower legs by the end of the workday. Consequently, in the long run, it can reduce the likelihood of contracting varicose veins. A sloping seat pan not only makes rising from the chair easier, but also allows your leg muscles to recover sooner because any postural changes and shifts are also easier. The Stance Move 5000 is recommended for people 5'-9" tall or shorter.